America has rediscovered the moon. 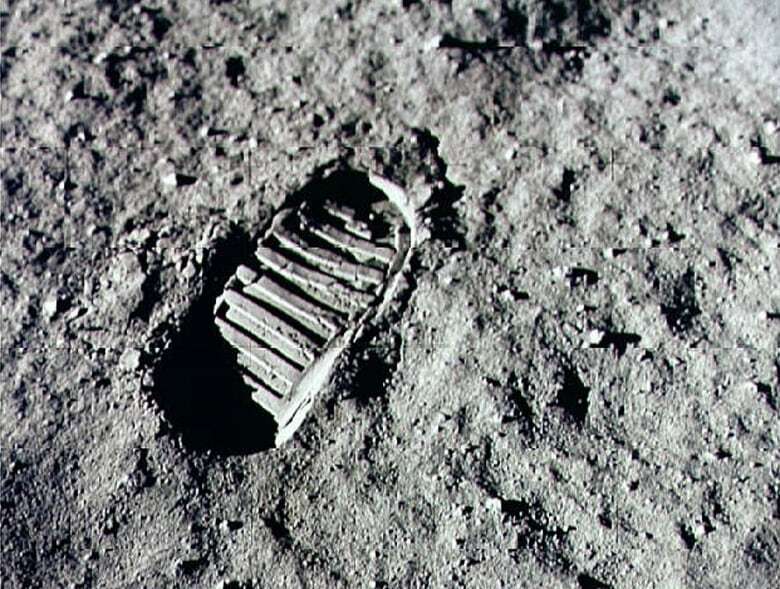 In a speech at NASA's Johnson Space Center In Houston yesterday, Vice President Mike Pence gave the clearest indication yet that the Trump administration intends to follow through on its promise to again put boots on the lunar ground after a 46-year absence. "Our sights are once again set on our lunar neighbour, this time we're not content with just leaving behind footprints — or even to leave at all," Pence told a theatre full of NASA employees. "The time has come, we really believe, for the United States of America to take what we have learned over these so many decades, put our ingenuity and creativity to work, and establish a permanent presence around and on the moon." An Apollo 11 astronaut's footprint in the lunar soil. 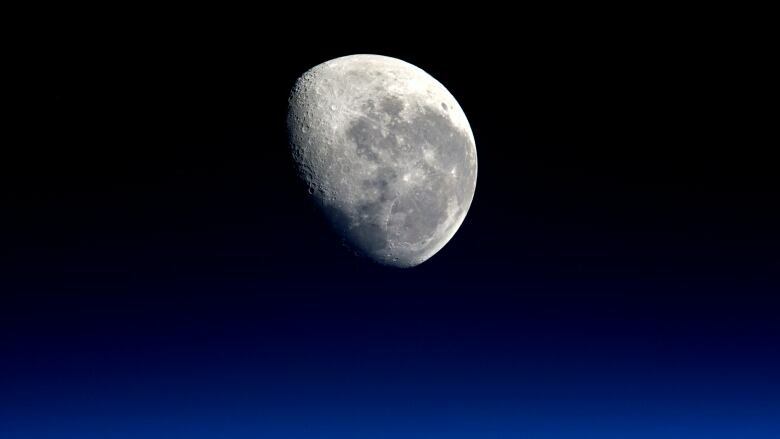 Humans have not visited the moon for 46 years, since the end of the U.S. Apollo program. (NASA/Getty Images)The U.S. Veep even added a timeline, suggesting that the first moon-orbiting "gateway" space station could be ready to receive astronauts by 2024. Earlier this week, NASA chief administrator Jim Bridenstine outlined his own priorities to reporters, and the moon loomed large. "I think a lot of people miss the fact that the moon represents an amazing proving ground for all of the technologies and the human-performance capabilities that are necessary to survive on another planet," said Bridenstine. "The moon represents the capabilities to do that activity for the first time, rather than doing it on Mars for the first time where you can't come home for another two years." U.S. Vice President Mike Pence, right, speaks with a scientist holding lunar samples during a visit to NASA's Johnson Space Center in Houston on Thursday. (David J. Phillip/Associated Press)The NASA chief said that he wants to use the gateway stations as jumping-off points for exploring all regions of the moon, not just the bright, equatorial zones where the Apollo program went between 1969 and 1972. "We didn't get the full perspective, the full understanding, the science and the knowledge," he said, pointing to the long-suspected and now confirmed presence of water in the form of ice at the moon's poles. The U.S. space agency has just put out a tender for a new partnership with private space companies to improve communications with its eventual moon base. And late last week, it quietly approved a key element of SpaceX's plans to start ferrying astronauts to the International Space Station and beyond, signing off on the idea of fueling up rockets while the crew is already onboard. 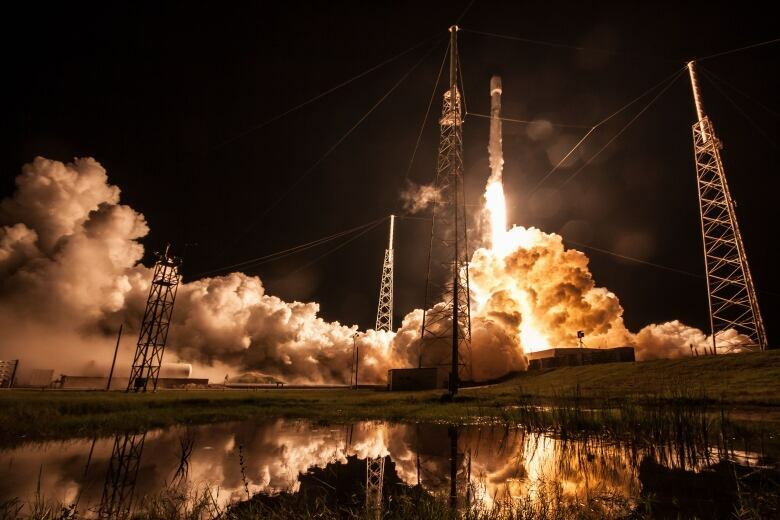 A SpaceX Falcon 9 rocket launches from the Cape Canaveral Air Force Station in July. (SpaceX)The "load and go" missions, as they are called, help make SpaceX's Falcon 9 flights cheaper and more fuel-efficient. But they add risk. An earlier, unmanned version of SpaceX's rocket exploded on the launch pad in September 2016, destroying a $200 million satellite owned by Facebook. SpaceX must successfully demo its new fueling procedures five times before NASA will provide the final go-ahead for trying it with a crew in place. 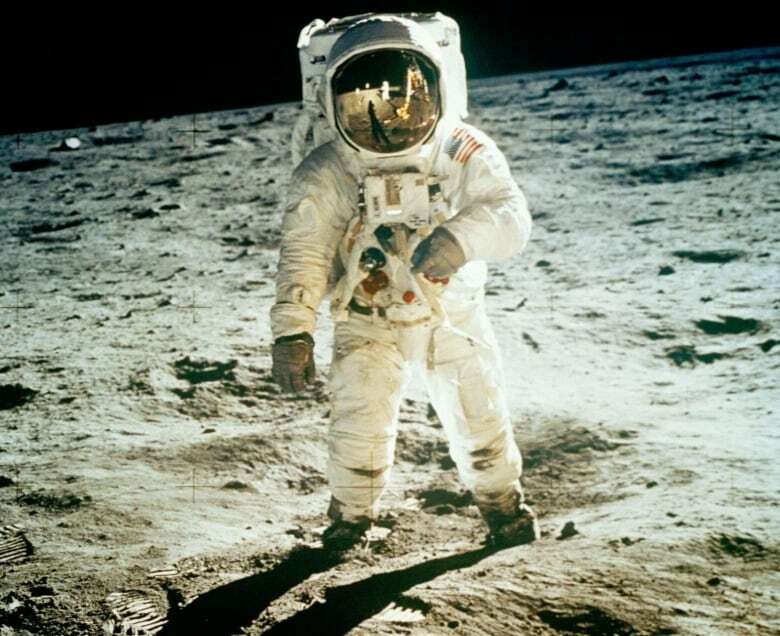 Almost 50 years on from Neil Armstrong and the gang, America remains the only nation to have put a human on a moon, but that dominance won't last. In this July 20, 1969 file photo, Astronaut Edwin E. Aldrin Jr., lunar module pilot, is photographed walking near the lunar module during the Apollo 11 extravehicular activity. (Associated Press)In May, China launched a relay satellite to facilitate its plans to put a robot lander on the dark side of the moon — a first — later this year. Their goal is to have astronauts on the moon by 2030. Russia is ramping up its moon program too, with plans to put a lander near its south pole early next year. And then there's India. Earlier this month, Prime Minister Narendra Modi announced his plan to launch the country's first manned space mission by 2022. Indian Prime Minister Narendra Modi addresses the nation on the country's Independence Day in New Delhi on Aug. 15, saying India will send a manned flight into space by 2022. (Manish Swarup/Associated Press)Given the recent success of India's space program — 237 satellite launches since 2014 — it's not inconceivable that its astronauts could get to the moon before anyone else. After all, India got an orbiter to Mars on its first try in 2014, for just $74 million — one ninth of what NASA spent sending its Maven probe to the red planet that same year. Nature might give British Columbia some help with its forest fires this weekend, as temperatures cool and breezes push out smoke — and there's even the hope of some rain. But it will take more than that to bring an end to the province's second-straight horrific fire season. As of last night, there were 464 active blazes and more than 5,000 people remain displaced from their homes, with a further 22,000 on evacuation watch. A map of B.C. 's forest fires as of Aug. 24, 2018. (B.C. Wildfire Service)Authorities remain particularly concerned about the aggressive fires in the central northern area between Smithers and Prince George, with the Verdun and Nadina Lake blazes demonstrating "exceptionally extreme fire behaviour." And there's also Alkali Lake, where several smaller wildfires have now combined into a single 100,000-hectare blaze. Some 4,700 kilometres to the southwest, they're having the opposite problem: too much rain. Hurricane Lane has been downgraded to a Category 2 storm this morning, but it is still battering the Hawaiian Islands. Over the past day, almost 60 centimetres of rain has fallen on part of Big Island, swelling rivers and creeks and causing spectacular flash floods, landslides and washing out roads. And more rain is forecast before the giant storm finally passes by on Saturday. There are also worries about other types of damage, with sustained winds of 177 km/h and even higher gusts. And on Maui, where there hasn't been as much rain, the high winds are fanning a fire. Corner store giant 7-Eleven appears to be preparing for a future that is arguably more convenient, but involves a lot fewer employees. The Japanese-owned, U.S.-headquartered company, which operates, franchises and licenses more than 66,000 stores in 17 countries, is embarking on some curious high-tech experiments. Customers enter Taiwan's first unstaffed store in Taipei, which sells more than 1,000 products. 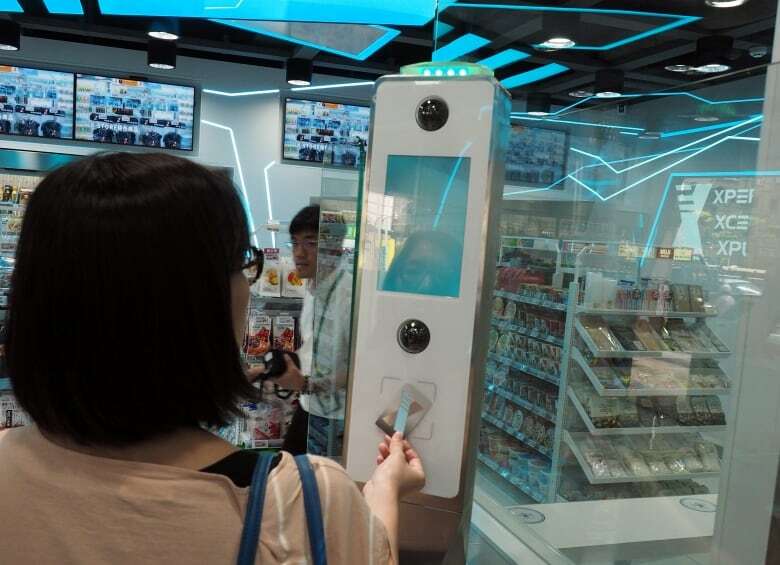 Customers must apply on the spot for an iCASH card and facial recognition, which will allow them to enter and leave the store and make purchases. Sensors in the store keep track of inventory. (David Chang/EPA-EFE)South Korean consumers are about to get subway-shaped "Express" stores that simply feature a row of linked-together vending machines. Each will carry a different category of products — packaged snack foods, drinks, meals, other processed junk, and non-food household items — offering around 200 items in total. Tobacco products and alcohol won't be among them. Seoul's Hankyoreh newspaper reports that the machines will accept only debit or credit cards — no cash. And there are plans for a small station with hot water and a microwave so hungry customers can make ramen noodles or heat up a pizza pocket. The stores will be unstaffed. A similar vending-machine-only outlet is already up and running in Taipei, Taiwan. A customer waits to pass a facial recognition check to enter the unstaffed store in Taipei. (David Chang/EPA-EFE)Shoppers in New York City, meanwhile, are getting a 7-Eleven app. The shouty, all-cap 7NOW allows customers in Manhattan and Brooklyn to order anything from snack foods to Slurpees to beer and have it delivered to their door, 24 hours a day, seven days a week, albeit for a $6 to $8 fee. The company is busy promoting the service by driving its delivery trucks around New York and handing out free stuff. In Australia, the company is going in a slightly different direction, having acquired a controlling interest in Tipple, a start-up that promises to deliver all types of booze to your door within 30 minutes. For now, the two firms will operate separately, but executives expect there will be "interesting opportunities" to link their customer bases. Joseph DePinto, 7-Eleven's CEO, has said he's positioning the company to compete with fast-food chains and drug stores for millennial who like to "one-stop shop." The CEO of 7-Eleven, Joe DePinto, says he's positioning the chain's stores to be one-stop-shops that appeal to millennials. (Alex Wong/Getty Images)But perhaps the multinational is also thinking of a future with fewer workers and troublesome franchisees. 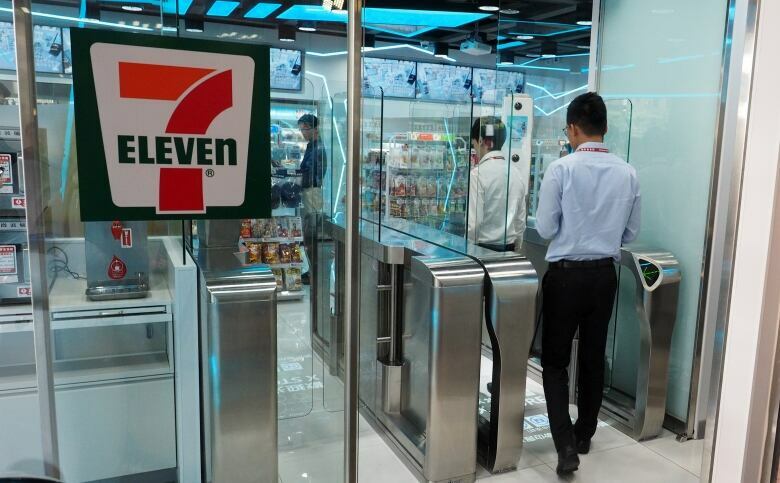 The operators of the 9,100 7-Eleven stores in the United States have a lot of complaints these days, many of them involving a revised franchise agreement that goes into effect next year. The contract will require franchisees to stock more 7-Eleven house brands, pay a $50,000 renewal fee, and stay open on Christmas Day. A National Coalition of Franchisees is demanding 45 changes to the agreement, saying that it will increase costs, reduce profitability and shift corporate legal burdens onto local owners. 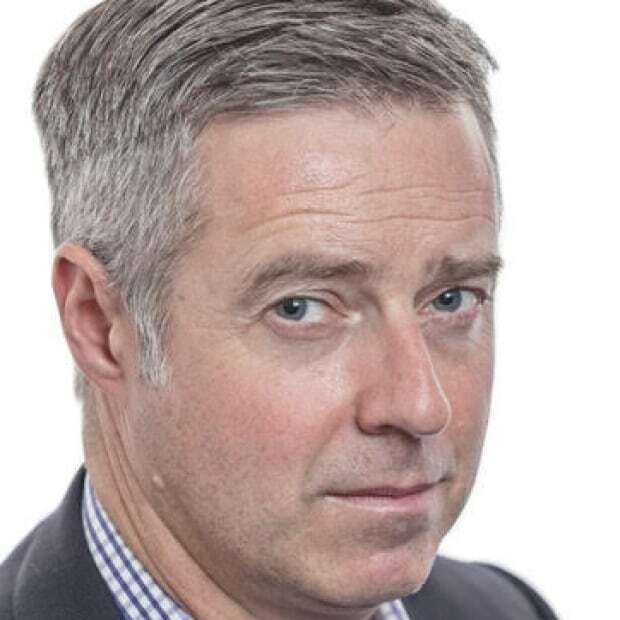 The splintering of the federal Conservatives. "We must never allow the politics of race or division or of setting Australians against each other to become part of our political culture. We have so much going for us in this country." 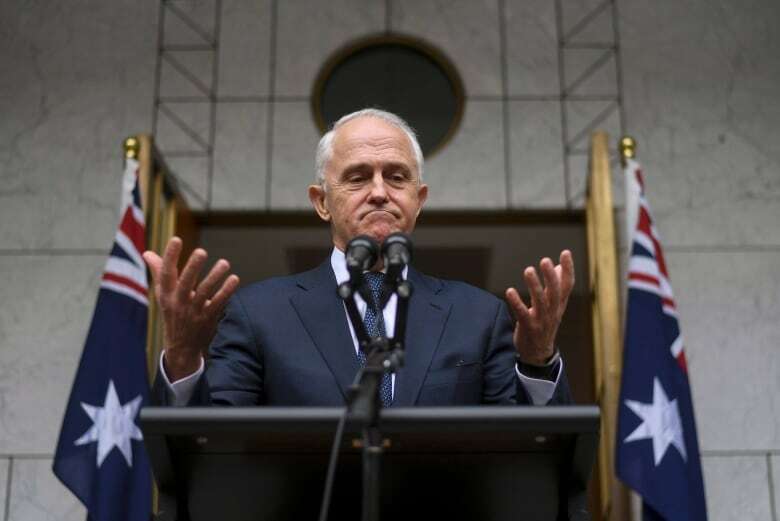 - Outgoing Australian Prime Minister Malcolm Turnbull takes a parting shot at hard-right elements within his Liberal party who succeeded in pushing him out today, but failed to install their chosen successor. Paul Hellyer was a prominent Liberal cabinet minister and, at one point, Pierre Trudeau's deputy-PM. Then he started his own Action Canada Party, crossed the floor to Progressive Conservatives, and even ran to become their leader. So Liberals in Toronto's St. Paul riding were a little skeptical when the old warhorse tried to mount a comeback in 1988. Hellyer said he had changed, or maybe reverted, but it wasn't enough to win him the nomination. A decade later he formed the Canadian Action Party. But today, the 95-year-old is probably best known for his well-publicized belief in UFOs.